In early May after my return from Canada, Catherine told me that she felt our domestic arrangement had come to an end and it was now time for her to live alone. She asked that I move out by September. She said the same to her brother Steve. I was stunned and devastated. "Where shall I go? What shall I do?" I wanted to say in Scarlett O'Hara fashion. "Frankly my dear I don't give a damn," said the the Bay Area housing crisis. I gave myself a month to wring my hands and absorb this shock. I had known my living situation was without a future in the sense that we were no longer in a committed relationship, but I had put my money on the mutually beneficial arrangement of my staying which had been going so well these last two years. That with all the care the two dogs demanded and the shared meals I made, the gardening and household chores I helped with she would want me to stay especially once she returned to working full-time. It was the only option I was willing to entertain because I had been enjoying a $700 rent for so long I would be hard put to afford a room in a house in the Bay Area. Most were double that. Perhaps I should have taken a different path I lamented. 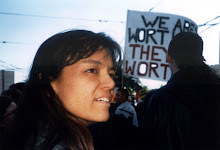 I had been told by our therapist and others that legally I did have the right even in a domestic partnership to sue for half the value of the pooled assets accrued during our 20 years together. I hadn't wanted to do it. I feared that it could get ugly and destroy our friendship. I had opted to see what would unfold if I stayed. Barring her meeting someone else she wanted to live with this seemed like a reasonable expectation. But now Catherine felt this transition period was over. It was time for her to move on, she said. I made another plea on my behalf. I mentioned that she had, at the time of our break-up, promised to buy me a tiny house on wheels. But when she researched online and saw figures close to $90,000, she said she didn't have the money and she did not foresee selling her house anytime soon (to free up cash). I didn't pursue it since she was allowing me to stay. Maybe something else would unfold I thought. "I'll buy you a tiny house," she said just like that as I recalled this discussion. This stopped me mid-argument. It had indeed been my dream to live in a tiny house one day even if I had to build it myself. A very big dream that I knew I would have to do alone for Catherine did not share this vision. The tiny house concept of self sufficient living embodied all the off-grid living ideas that I had been experimenting with for the last fifteen years. To actually live in one would allow me to fully realize my passion for this life. With Catherine's offer of the tiny house my grief and shock were arrested as I remembered the full potential of this vision. And they were not, after all, as expensive as she had anticipated given what I had in mind. A shell that was unfinished inside could be had for $25,000. I accepted her offer gratefully and immediately went to Craigslist to look for such a tiny house on wheels. A year ago almost to the day, I had attended a two-day workshop where I had listened to a young woman teach a roomful of would be builders how to build and live in a tiny house on wheels. The workshop was given by the Tumbleweed company formed by the original creator of tiny houses to sell plans to would be builders. The tiny house that our workshop leader lived on was parked on a property out by the coast next to a horse paddock. That she was a cello player with a degree from a university in Europe fit right into my scenario of wealthy patronage hosting such a high end tiny house. The scenario evoked all my experience of negotiating class and racial boundaries in the Bay Area. This was an elitist solution I felt, a diminutive version of a high end house with all the material wants of a Western lifestyle. It changed very little about how one lived apart from having less room to live it in. And it would still require that you had a relationship with land to park it on which implied that you had enough social equity to find a host who would be willing to let you live on their land possibly illegally given city zoning. You could not even buy land and park the house on it because there were laws against "camping" on your land. There were also laws that prevented you building normal houses small enough to afford because most towns had square footage ordinances that prevented such tiny dwellings. Zoning was how the American landscape was divided into economic apartheid. 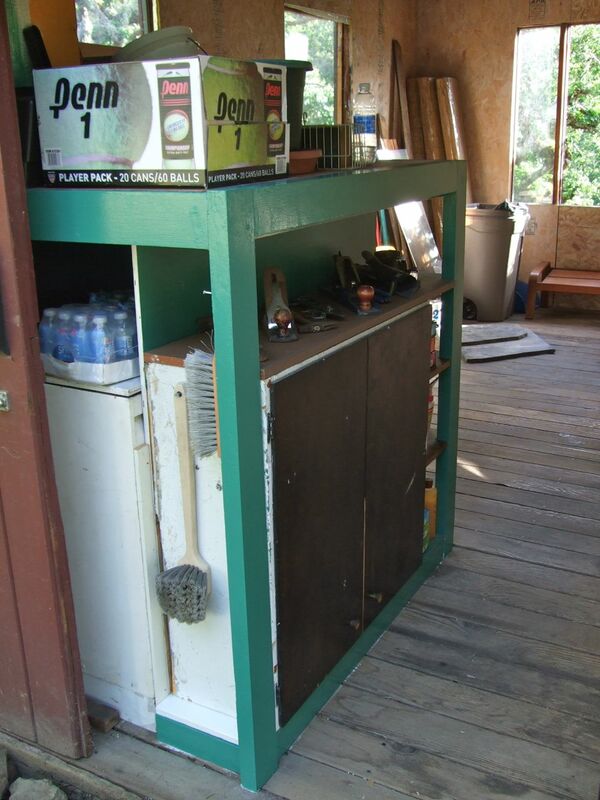 Building the house on a trailer was a way to get around building codes. Still I loved the idea of living in such a compact, well designed space that I could custom fit to my own habits. It was an opportunity to design a lifestyle that would incorporate my ideas of how one would live using the least amount of resources possible. In fact I so wanted to experience such a space that I decided to design and build a mock tiny house just to see how it would feel. For this experiment I chose to build a loft in my mother's one car garage which was about the same size as a tiny house being 91/2 feet by 20 feet and was a separate building made of wood resembling a 1920's board and batten cabin. I had in fact already cut holes into the walls for windows when I was enrolled in a construction class a decade ago and wanted to practice my carpentry skills. By returning to this unfinished space for this project I was able to hone my tiny house building skills, practice installing electric lights and outlets, then finish the walls and paint them the white wash I so wanted to see over the OSB strand board I put up for the walls. The project not only improved my building skills it honed my mind to make decisions around all the details of living in a tiny space. Intellectually I was able to investigate practical aspects of spacial design, compact storage and how to make multi-use built-in features that would cleverly transform the function of the space. I experimented with salvage materials to see what could be used that might otherwise go to landfill. Bed pillows for instance made very good insulation for walls. Over a six month period of working a couple hours every other day, I put in 230 hours and the garage was transformed from a rat infested haphazard store room into a pleasant light filled studio space with ample storage in the loft I had designed. And all using wood I had saved over the years (and stored in same garage) and what I found on craigslist mostly for free. How I loved that humble building. And how I enjoyed improving the space and adding value to my mother's property. In considering what size of tiny house on wheels I would choose to buy I remembered something my cello playing instructor had said when I went to visit her tiny house at the bottom of the horse paddock. If she had to build it again she would go smaller, she said, because even in this small a house of 24ft by 8ft there was still plenty of room to accumulate excess stuff. And this included a boyfriend and two dogs. She would go to 18 feet she said. 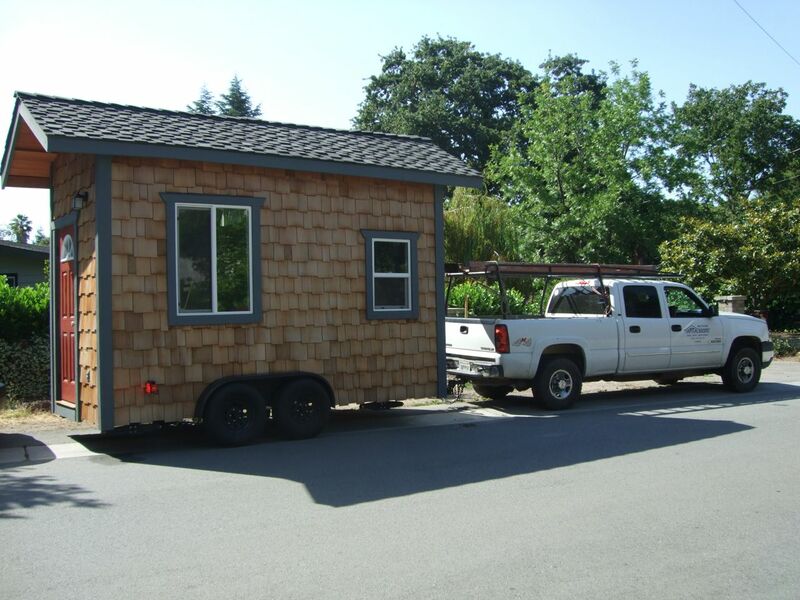 So when I went to craigslist that night to look for a tiny house I was looking for the smallest I could find. And there it was. It was beautiful being all shingled in cedar and having a red door. The photograph of it was so professionally done that it looked like a magazine cover. But it cost $32,500 and that was just too much I thought for an unfinished house. A few days later I looked again and there was a lengthy description telling the story of why this house had been built. Apparently two dads, John who sold things and Phil who was a professional roofer, had decided to build their families a vacation cabin. It was their plan to park it on a friend's land. They put into the project the highest quality materials they could find including high end windows and a wood floor. It was fully insulated and wired with electric outlets and wall sconce lights, but was otherwise empty inside. It had taken them a year and a half to build this much, by which time the friend had sold the land and their plans to use it were moot. As I read the description of the house I could feel the love they had poured into this project and how proud they were of it. The interior was lined with reclaimed salvaged redwood fence boards that gave the interior a soft variegated look. This fooled the eyed into thinking it was bigger than it was. The ladder to the loft was built from heavy beams from an old barn and was sturdy enough for a big man. It was small, only 6 feet wide inside and 14 feet long which was perfect because I wanted a narrow profile to better fit on a narrow piece of land. I had it in mind to park it at my mother's house next to the the beloved garage where I had been building the mock tiny house. To express my appreciation I wrote the seller a fan letter admiring the quality of the build. Then since such a letter seemed to warrant a reason for my writing it I explained that I could not buy it because my budget was only $23,000 or so. Ten minutes later John called me and said I could have it for $26,000. This was a considerable discount. I would get back to him, I said. I showed the ad to Catherine and she agreed to buy it if it was the one I wanted. And that Saturday I went to see it taking with me my new friend Tim, a carpenter I had met by chance just before I needed help to patch the leaky roof of my mother's garage. To make sure I had a place to put this house, I had proposed to my mother that I park it on her property. She was not enthusiastic about the idea, but her boyfriend Bill had been more encouraging. "Think of the benefits of an onsite cat sitter," he said over dinner. When I showed her the glamorous pictures of the tiny house she clearly saw how lovely it was and urged me to buy it before someone else did. In terms of home ownership it was not very much money she noted. This was all the encouragement I needed. Tim and I drove all the way to Hollister to see it. Once I laid eyes on the tiny house in person the height of it was a little scary. It was almost the height of a two story building, but I ignored that warning feeling for it was the height that made the inside bearable since there was so much space above your head. Tim asked Phil about the methods used to strengthen the walls. All was done to the highest standards. I felt confident to mover forward and put down a deposit of $1000 then set about preparing for the arrival of the tiny house in two weeks. I went home thinking I was well on my way to living my dream, but instead I spent a sleepless night wondering how such a high profile tiny house was going to be received in the neighborhood. For much as they seem so perfect a solution to homelessness, they were not legal to live in. It was legal to park them, just as an RV is legal to park on private property, but if you were living in it and the neighbors complained you could by local ordinance be evicted from your own house. To quell my anxiety I decided to ask the nearest neighbor who kept an eye on my mother's house, what she thought of such an endeavor. My mother, however preempted this meeting when she called me in the morning and told me she could not allow me to park the house on her property. It was just too evocative; it would soon attract the attention of the county officials. I had to agree that she was right and so I had to choose to either give up this dream (and my deposit) or pursue it in an aggressive manner unlike my usual low key approach. I never liked to ask for anything. I wrote up an ad on craigslist in search of a place to park and listed what I was willing to offer in terms of a little rent ($300-$600) and a lot of skills for home maintenance, gardening and care taking. I used the same beautiful picture of the house that had caught my eye. And I posted the link to the ad to Facebook and Twitter and the Yahoo group of my colleagues. People wrote back words of encouragement and ten of my friends posted it to their pages asking their friends if they knew of a space. I did get some very nice responses both from friends of friends and strangers, but they were in the East Bay outside of my area and far away from clients which I was not prepared to do just yet. Still I felt enormously supported and loved it kept my heart open for a favorable response. The purchase of this house with no land to put it on would render my dream an albatross that would cost me money to store it and be impossible to sell since few who have such cash are willing to live in a shoebox. I went away for the weekend to a house party where I got the opinion of all those present. My closest friends agreed that this could easily go sour, but one friend who had had many adventures in buying property encouraged me to go for it, because whatever happened I would end up owning something beautiful. I might end up leaving the Bay Area to live in it, but it might be worth it and if I left the country I could put everything I owned into it and still pay the same fee for storage as I would for my stuff alone and I would have something to come back to. That night I picked up an e-mail from an acquaintance I knew from my Buddhist meditation center with whom I had done some solar oven demonstrations. She wrote me that she had a space in her backyard that might work. This was extremely encouraging. As soon as I got back from my house party I went to see her site. It was indeed feasible and well located being only ten minutes from my present home. I envisioned some fine collaborative eco projects in this garden for we had a shared eco sensibility. The space did, however need a lot of preparation in the trimming of bushes and moving of storage units. It was a tight space with sparse room around it. It was clear I would need a temporary place to park while I finished building the interior of the tiny house. There was another possibility that had been appearing in the back of my mind. Only a mile away from this site was my childhood home where there was a two car garage and a driveway down a cul-de-sac that would keep the tiny house hidden from view from the street. I could see myself working from my father's workshop using his tools and workbench. Could feel him helping me though he'd been gone now for 14 years and my stepmother had inherited the house. My father had been a complex and difficult man given to rudeness and temper tantrums in my youth and a peculiar lack of understanding of human relationships, yet he was a brilliant engineer who had built his own computer in order to stay relevant to his work. He had had in all likelihood what we would now diagnose as Asperger's. The circumstances of his long illness with throat cancer that eventually led to his death had been trying to both me and my stepmother. I had not been very patient or diplomatic in my participation in his care while my stepmother had to contend with the brunt of his anxiety and non-compliance to his doctor's orders. I could not imagine myself asking her for any favors so estranged had we become. But as it happened I had recently spent some time with her and had had a chance to renew our acquaintance. While I was in Thailand for my mud hut building workshop I had been in Bangkok at the same time as she was, sharing the house my father built on the family compound which he had left to both of us. She was there with her boyfriend, a doctor who was charming and friendly to everyone in the household. So much so that all the difficulties of our family relationships seemed to fall away. He was warms towards me too. As I contemplated whether or not to ask her I realized that I had for so long put her in the roll of the heavy in my life as the figure who had usurped my inheritance, that she might welcome the opportunity to be my savior if I would only ask. Unfortunately I couldn't call her to explain to her the situation or even what a tiny house was because she and the doctor were in Germany on holiday. Time was ticking down so I wrote to her through Facebook explaining what I wanted to do. She didn't respond at first so I wrote again giving more details of my soon to be homeless status which could end up with me living in Bangkok in the house we shared. She wrote back with her cell phone and said to call her. She was sympathetic. Her only concern was that she would be able to get her car out of the garage and that the neighbors be informed. Neither was a problem so she said yes. I was so relieved. I had asked for help from so many people to get this house that I could truly say it takes a village to live tiny. The day the tiny house rolled into town, the neighbors came out to see the house as it pulled up and stopped on the side of the road. "I love your tiny house," said a woman as she drove by. "Pull it in here, I'll make room," said the neighbor across the way. The neighbor in front of my stepmother's house came out to network with my builders. The two men had towed the tiny house all the way from Hollister. On the pickup towing it was a ladder strapped to the truck rack. This came in handy. The overhanging trees in the driveway did not clear the roof of the house adding to the drama of its arrival. The 20ft ladder was set up to allow Phil to climb on the roof and lift the branches out of the way while the truck was pulled forward. Then another difficult maneuver to back the house into position in the driveway. Once the house was leveled with the jacks at each corner it was done. All that was left was for me to hand over the cash. When my stepmother returned she and the doctor welcomed me by inviting me to lunch when I came to work on the house. This offering of food was very Thai and made me feel right at home. It warmed my heart to feel so welcomed. I was eager to help with the chores she asked of me in return — hauling away things mostly, much of it my father's old books and papers. Her friends who came by admired the house in the driveway. I was buoyed up by the reception to the tiny house. My tiny house. I was suddenly a celebrity with this cute unusual big thing. Thanks to the cable TV show Tiny House Nation and a few other similar shows, the phenomena of tiny houses had captured the American imagination. The compactness of such a lifestyle was a kind of antithesis to the horrors of excessive consumerism and collecting of stuff that had made the hoarding shows so popular. It solved the problems of mortgage debt and provided the mobility needed to follow job assignments. Viewers were charmed by the idea (though most did not want to live so small). There seemed to be no end to the cleverness that could be built into them. And now I was a part of this phenomena. An early adopter of a new innovation. Housing 2.0. I marveled at how I had gone from homelessness to tiny house ownership in a mere three weeks. The tension in my relationship with Catherine evaporated too for I no longer had to be vigilant about a living situation that was forever poised to change. We would remain friends. I came to see that there are those in your life whose role it is to make sure you fulfill your destiny when you are too comfortable or too complacent to get around to it yourself. The tiny house was my destiny now. One that unfolded so effortlessly once I was committed to it that it elevated me to a new level of manifesting my life. The next few months would completely absorb and stimulate every cell of creativity I possessed. Ideas rolled out of my head and were manifested within the week with components that just seemed to turn up. I envisioned myself giving tiny house tours and tiny house dinner parties. To join in with the tiny house community I started a new blog to have a record of this new phase of my life and a blow by blow account of the build with photos. It's called "Tiny Red Desk: Living The Tiny Life". (I named it after the color of my writing desk). There you can join me for the tiny house journey. Thanks for dropping by Sabine. That's quite an adventurous step. I think consumers are sometimes well suited to living in tiny houses. 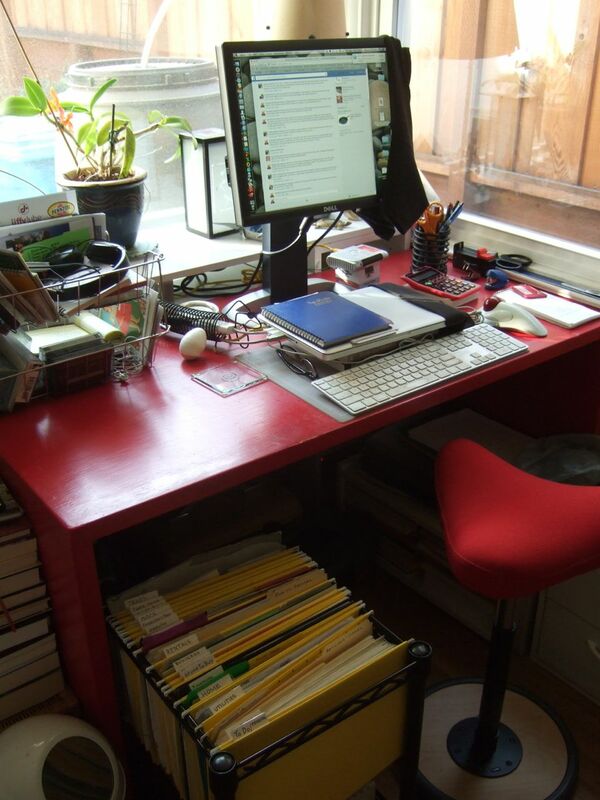 People who plan well make great use of tiny spaces and save a ton of money. They not only cost less to set up initially but also cost less to maintain. For example heating them during winter is less expensive than a larger space.